Papa John's sure loves a pizza in a seasonally-appropriate shape. Around Valentine's Day, the now Papa-less chain drops a heart-shaped pizza, which is great because everyone knows pizza is better than flowers. For Halloween, the pizza slingers put together a jack-o'-lantern-shaped pizza. It's not as clear-cut of an upgrade as Valentine's Day when a box of chocolates has nothing on melted cheese. A giant bag of Halloween candy can surely give pizza a run for its money. Nonetheless, pizza is always good, and it is National Pizza Month. The pumpkin-shaped pizza will be available through October 31, along with a bunch of deals on larger orders, in case you are hosting a monster mash. 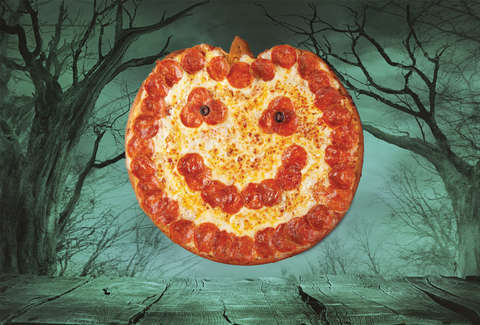 If you're not throwing a party, one novelty jack-o'-lantern pizza will run you $11 and can be obtained by using the code "JACKOLANTERN" on the Papa John's website through Halloween. The group deals include five large one-topping pizzas for $42.50 with the code "SCARE," five large one-topping pizzas with three sides or desserts for $55 with the code "GHOST," and others that can be seen at Thrillist's National Pizza Month deals roundup.